What does it mean to go from Zero to One? Doing something which you already know how takes the world from “1 to n” but creating something new takes the world from “0 to 1”. So adding the feature of “Stories” (like Snapchat) in Instagram was like going from “1 to n“ whereas creation of a rocket by SpaceX which can be reused after launching the satellite was like going from zero to one. Perfect Competition vs Monopoly: Why Monopoly is better than Perfect Competition? Competition decreases the prices of goods which results in decreased profits, so it is bad for businesses. Since companies will earn less, they will pay minimum wages to their workers. When companies do not face competition, then they can focus on things other than profits, like the wellness of employees, innovation, making the world a better place, etc. Learn about the work culture of Google. Companies can create their monopoly only when they produce excellent products. They do not simply collect high prices, customers willingly pay them a high price because of the superior quality they provide. Apple created its monopoly in the smartphone market because its phones were so good that everyone wanted them. If Apple would have been another mediocre smartphone manufacturer then there had been perfect competition with low priced phones but the customers would have never had a great phone. Monopolies are not indestructible. When another company creates something phenomenal then the throne is taken away from them. In today’s dynamic market, if a company wants to maintain its position then it has to keep innovating. Hence monopoly does not mean a stall in progress. If the monopoly had been a bad situation then the government would have made laws to prevent it. But the government protects monopolies by making laws like copyright, trademark, license etc. The protective laws of the government make sure that a monopoly enjoys high margins for a considerable long time. These laws motivate companies to thrive for monopolies even more. Therefore a startup should always try to create its monopoly in the market, it is beneficial for everyone. Proprietary Technology- If your startup has its own proprietary technology then it becomes difficult for your competitors to replicate your product. But your technology should be at least 10 times better than your closest substitute in some important dimension. If your product is not so better then it will be perceived as a marginal improvement to the already available products and it will be hard to sell. The best way to create something so much better is to create something completely new altogether. Google’s algorithm provided better results with very less page load time and accurate autocompletion. Amazon had many times more books than any bookstore. Apple’s iPad was way better than what was being offered by Microsoft and Nokia at that time. Network Effect- Network effect makes a product more useful when more people use it. Many people use Facebook and Whatsapp because most of their friends use them. Just like we said in The Lean Startup Summary, your product should have a network effect. Products with network effect should start with a very small market with the customers concentrated together. Facebook started with users concentrated in the university campus, PayPal became successful when it started catering to customers who were selling only on eBay. Economy of Scale- As we saw in the summary of the Millionaire Fastlane, your business should be scalable. If you are not able to scale your business to cover a greater audience, your revenue will stop increasing after some time. But your fixed cost should not increase equally as you scale. Companies selling ebooks or digital music have to spend money while producing them, after that they can sell the copies at a very large scale through the internet. Branding- Your brand helps people remember you and recognize you. People associate themselves with brands. But it is necessary that first, you create a great product otherwise, there is no use of burning money in marketing. Apple is the biggest tech brand today because it has great products. Marketing activities done by Apple can be done by any company with budgets. To go from zero to one, you need to create something new, something which never existed. What you are creating does not exist because people never found it before, and hence it is a secret. Your job is to find that secret. Hotel businesses were running for ages but before Airbnb, nobody knew about the secret demand for very cheap homelike spaces and the secret supply of unoccupied spaces available at people’s homes. To find the secret on which your company will be built, you can consider looking into things which are taboo. In India, meeting of two unmarried people of opposite genders, and spending a night together, is considered taboo. Therefore it was very difficult for unmarried couples to find hotel rooms to spend some quality time. Hotel owners simply denied giving a room to the couples. Since it was taboo but not illegal, some companies found an opportunity there. Now companies like Goibibo, Make My Trip and Oyo give couple friendly rooms. An influx of a new kind of customers is now enjoyed by these companies. You need to look for secrets where nobody is looking. You need to find a field which is important but hasn’t been standardized and institutionalized yet. Founding Matrimony- Start with someone with whom you have a prehistory. Founders should gel up together easily. Otherwise, small altercations can destroy the whole company. Ownership, Possession and Control- To avoid future feuds, have a clarity on who legally owns the company’s equity? Who actually runs the company on a daily basis? And who formally governs the company’s affairs? On the bus or off the bus- Always hire full-time employees. Part-timers are fundamentally misaligned with your company. Cash is not the king- The lower a founder pays himself, the better the company performs. Vested Interests- Distribute your equity wisely and keep the ownership of shares confidential to avoid resentment. Beyond Professionalism- The people working in your organization should have a relationship which is limited to their professional life. People should not be working with people they don’t like. Recruiting Conspirators- Why should a talented person work with you when he has plenty of opportunities to work elsewhere? Why are you a perfect fit for him/her? You should have answers to such questions. Talented people should not be joining you because of equity or salary, they must be excited about the work you do. Do one thing– Everyone’s responsibility should be unique and clear so that there is no conflict related to responsibilities. Of cults and consultants- Your organization should be like a cult where everyone believes in what you do. Otherwise, people will keep coming and going, they will not care much about the future of the company. Sales and marketing are necessary for your company. Even when your product is great how would people know about it unless you tell them? Complex Sales- When a deal is of very high value (seven figures), people want to talk directly to the CEO, not a salesman. Personal Sales- Personal sales should be used in businesses which are selling products with smaller value, (between $10,000 and $100,000). Marketing and Advertising- Low priced products like grocery items and cosmetics require marketing and advertisements. It helps in reaching a wider audience with a very small cost. Viral Marketing- When the core functionality of a product encourages its users to invite their friends and family to become users too, then the product is said to be viral. This growth is very cheap. The process of joining and inviting should be effortless for the success of viral marketing. Make sure your marketing team knows about the principles of influence. The engineering question- Can you create breakthrough technology instead of incremental improvements? 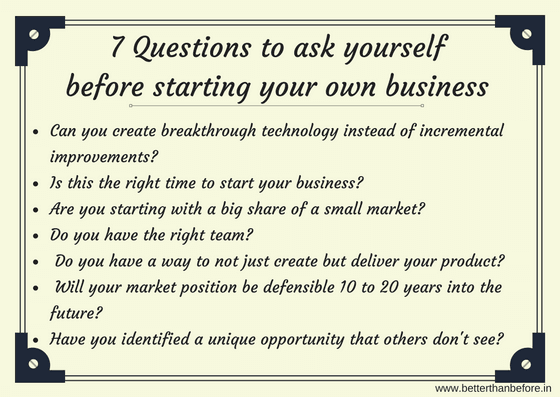 The timing question- Is this the right time to start your business? The Monopoly question- Are you starting with a big share of a small market? The people question- Do you have the right team? The distribution question- Do you have a way to not just create but deliver your product? The durability question- Will your market position be defensible 10 to 20 years into the future? The secret question- Have you identified a unique opportunity that others don’t see? So these were some important concepts from Zero to One by Peter Theil. Apply them when you start your own business. Read the full book for proper understanding of the concepts.